service and running on time. make an appointment Here’s proof! Board-certified MD dermatologists in a clean modern office. Obsessed with customer service and running on-time. We see children and adults for medical, surgical, cosmetic, and laser dermatology. Never an automated phone menu, always a live person. Early morning, early evening, and saturdays. Two of our doctors are assistant professors of dermatology & teach at University of Miami School of Medicine. I was very pleased with the services I received. The office is clean, and the staff has accommodated me at the last minute. Dr Todd Minars is very knowledgeable and thorough. Dr Vivas is also very sweet and answers all my questions without making me feel hurried. She's even prescribed a compound cream that has markedly improved my skin. I've been going to Dr. Todd for about 4 years. He is absolutely awesome. He is very knowledgeable and thorough. He has spotted things that have required removal and referred me to the proper doctors in the office for moes surgery. The office is the most efficient office I have ever seen. I have never waited more than 5 minutes to see the doctor. This is a fantastic place with top notch doctors. Dr Minars is extremely knowledgeable, quick to diagnose and help with solutions. Even has great sense of humor. I highly recommend him for your dermatological needs. I have never seen a dermatologist on a regular basis but now I am so happy I now have one that I trust for amazing service, true understanding of what I need and a clean, welcoming office. The staff are super attentive from when you walk in the door to when you check out. I have seen Dr. Todd for both skincare and anti aging needs. He was conservative yet thoughtful and understanding when it came to making recommendations. I really appreciated all of the time he took with me and how he explained step by step what he wanted to do. For someone new to getting Botox, he made me feel completely comfortable and the results are amazing. I can't wait to go back! I am super happy and recommend that anyone looking for dermatologist check out Minars Dermatology. I first started with Dr. Todd but then continued with Diane and she's amazing. She replies quickly to the emails when making appointments. Good thing about this place is that you don't have to be tied down to a package like other laser removal places. A+ doctors, A+ facility, A+ staff, A+ service. I'm so happy I found this place. I'm extremely picky when it come to doctors but this place has greatly exceeded my expectations. My doctor is Dr. Todd Minars, he's very knowledgeable and left me impressed with the way he approached and treated my skin condition. Also, I was interested in some skin cosmetics (laser) and he and his dad (Norman Minars) were able to coach me on the treatment. They are both dermatology professors at University of Miami; it can't get better than this. Fantastic office with a great staff! Appointments are always on time, and the doctors are very nice & professional. This is a very well run office and your questions are always answered patiently and thoroughly. I've never had a bad experience here and highly Recommend them for any of your dermatology needs! Dr Todd is a wonderful doctor and a caring human being. He makes time for all his patients (even the last minute calls). His office is incredibly efficient. Excellent care. Had a great visit with "Minars Dermatology". The office was beautiful, clean and modern. The staff was very friendly. 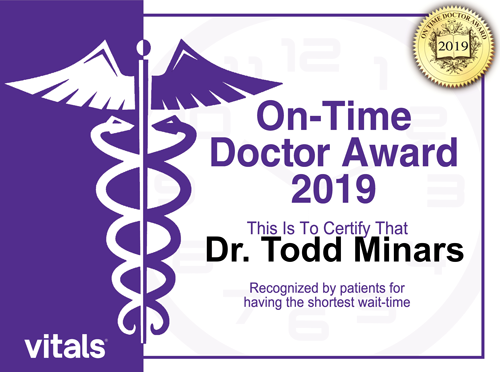 Dr. Todd Minars took his time and was friendly and thorough. Great experience! I brought my six year old to see him. Very warm and friendly, took the time to make my child feel comfortable. I highly recommend "Minars Dermatology". Will definitely be back! I have been going to Minars Dermatology quite frequently the last few months. I have had appts with Dr.Todd and Tracy for different reasons. They were both professional and knowledgeable. I have also seen Diane (Aesthetician) and she is great. The office staff is pleasant. I've never had any problems with Minars Dermatology. I for sure recommend them. 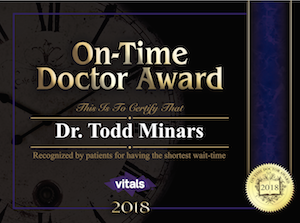 I have been going to Dr. Todd Minars for several years now, and have always received nothing but the most friendly, professional and timely services. Their office is immaculate and very nicely decorated in the waiting area. Going to the dermatologist isnt always the most fun thing to do, but the whole staff at Minars Dermatology makes you feel welcome and comfortable. Thank you Dr. Todd for always being on the cutting edge of your field... I will always trust you with my skincare needs! Love the office staff, the efficiency and the professionalism. We have been patients for close to ten years and it's been an all-around excellent experience, from acne care to electrolysis. I just had a quick skin check, so can't comment much in depth. I liked how up to date they are with technology- you can email your insurance card to them. Some places are still weird about having it on your phone. Everyone was pleasant and I was seen on time. Practicioners name I forget, started with an M, but she was really nice and put my mind at ease on some suspicious moles. Keeping an eye on the billing as I read some reviews on here about overbillling. Will update if necessary. They did call before to let me know my insurance had been flagged- which makes no sense as its been accepting claims fine all month. I have been going to Diane for my laser hair removal treatments on my bikini and lip , and I have to say that the results are amazing. She's very knowledgable and knows what she's doing, makes the process quick and easy. So far I've had 3 treatments and my hair has slowed the growth rate down to 3 1/2 months at a time without hair! Amazing !! Completely happy with my results and I can't wait to continue my journey to hair free .The office is clean and welcoming. As a parent you look for kindness and confidence when having your children treated. This is what I found with Minars. Both of my children see Dr. Huo and we couldn't be more happy with the results each time. I have recommended this place several times and am surprised by the reviews on Yelp. I have never had a problem and will continue to recommend Minars to others. This office is very well organized. There is almost no wait time. The staff are very friendly and professional. I saw Dr Norman Minars who is both very experienced and personable. The procedure was quick and almost painless. I'd definitely come back for future dermatological needs. Amazing staff and doctors. I was referred by a friend and will never go anywhere else! I love this place! The staff is very helpful and friendly. When I make my appointments I don't have to wait for more than one or two minutes before they call my name. I would definitely recommend this place! And Diane Muzic is the best esthetician in the world! I love this place for the reason I have two big brown spots on my face that I been covering up for three years. I've been going to spas to do facial and all they did was more damaged. I go to Minars one time and the Dr was very nice to me explained what I had and gave me a cream for my spots , its been 3 weeks and it's working, it's fading. I still have more to go but for the first time I don't have to wear so much make-up in this FL heat. i feel good again. The place is nice they took my insurance and I paid my copayment. I will go back and tell my friends about this place. It was difficult finding a professional dermatologist office that first focused on clinical issues and then went on to the cosmetic options. Everyone in the office is pleasant and helpful. My appointments are always right on time . I would recommend this office to anyone needing a dermatologist, male or female. Best dermatologist around. The office is clean, high-end, with an amazing office staff. The services they provide are first rate and all of the doctors keep current with new technologies and procedures. Diane, the esthetician, is very knowledgeable and works with you to make the best decisions for your skin care. Highly recommended!! Highly Highly recommend!!!! I've only seen Diane,aesthetician,she's the sweetest most knowledgable. She does a great work and has a great follow up! I accompanied my mom to her appointment with Dr. Todd Minars and we both loved the experience so much that she asked me to write this review and I am gladly doing it! Our experience with this office was top of the line. The office is beautiful, and staff if friendly and very professional, and Dr. Minars was very knowledgable and efficient. Lastly, we live in NY and the doctor made himself available to answer follow-up questions over the phone after our appointment the very same day my mom called to speak with him, despite knowing that we may not have an opportunity to come back to his office as repeat customers since we do not live in FL. We rate this office A++ and would recommend anyone looking for a dermatologist to make an appointment with this office! My whole family goes here and we love it here! Everyone is so nice and so knowledgeable and treats us like family the minute we walk in the door. We all see Dr. Todd Minars and he is very patient explaining everything so my younger daughters can understand any procedure he might be doing. The office is extremely clean. And they do an amazing job with scheduling; I have never felt forgotten in the lobby area because I have never sat there long enough. I definitely recommend seeing Minars dermatology for any dermatological needs you might have! This is by far the best dermatology place around. The doctors are very caring and thorough. The staff is great and very helpful. I recommend Minars Dermatology to everyone. I just wish they had Minars Dermatology in Boston where I currently live now!! I love this office. Dr Todd Minars is a Rock Star - fixes the problems with patience and care. Over the past few years they have moved the office to a larger space in the same complex while adding specialists, like Medical Esthetician Diane Litwer. Make an appointment with her and watch the magic happen. I've been coming to this office for some time now and every single time it has been a great experience! I always get called in right away, I barely ever have to wait. For example, today I went in and my waiting time must have been less than a minute or two. All the staff are always very helpful and friendly (Zenia and Debbie from the front desk are great) and the doctors are very efficient and most importantly focused and extremely knowledgeable. Have dealt with Dr. Lesley Clark-Loeser, Dr. Marianna Blyumin-Karasik as well as Dr. Todd Minars! Best dermatologists in Fl! Dr. Todd Minars helped me get rid off a cystic acne located in my lower chin area today that I've had for a few weeks so I'm very happy now, you're awesome, you rock... thank you so much! No wait, friendly nurses and professional doctors. This office is one of the best decorated offices I've been too. Parking stinks! Dr. Blyumin is an incredible dermatologist. She is probably the nicest doctor I know and is incredibly eager to help me when I have problems with my skin. The office staff is also friendly, and I almost never wait longer than 5 minutes. You know I'm a loyal customer because I live in Kendall and drive 45 minutes to see her up in Hollywood. She's that good and for me, the drive is worth it. I highly recommend her and this center for anyone looking for a dermatologist who is professional, courteous and well qualified. Outstanding service and experience in this group. I am very happy with their service and with the quick treatment both myself and my husband received here. Would highly recommend! I was concerned with a mole on my chest and made an appointment with Dr Clark-Loeser who came highly recommended by a colleague who is a patient herself. The facility is beautiful and impeccable- a feature I always look for in a healthcare or cosmetic setting. The staff is very nice, and well, Dr Clark exceeded my expectations. She is very knowledgeable and professional. Since my appointment I have become hooked on another service offered at Minars- salicylic peels. These can be done by the esthetician Diane without need to see the doctor if your an existing patient. I have noticed a difference in the appearance of my skin and through the course of several appointments I've become more knowledgeable on how to care for my skin. I definately recommend Minars Dermatology whether it be for cosmetic or health related needs! I have been going to Minars Dermatology for nearly 10 years and I can tell you, without a doubt, that it is one of the best dermatology centers in the country. Dr. Todd Minars is a brilliant doctor and the integrity he has within his profession is superb. I have also seen Dr. Lesley Clark-Loeser and her bedside manner, knowledge, and sweetness adds a great feminine touch to the practice. Their new office is beautiful and inviting. For fabulous care and an amazing group of doctors, there really is no other place to go in South Florida. I am very thankful that I found Minars Dermatology. I was seen by Dr. Norman Minars. The treatment I received went exactly as the doctor explained it would go. He was extremely kind and thorough and I am very satisfied with the results. The office staff was friendly, professional, and well organized. For three appointments (consultation, treatment, and follow up) I was seen exactly on time, which is so rare for a doctor's office. The office is also very nicely decorated and pleasant looking, which of course is not the most important detail, but the atmosphere is very nice. I will very happily recommend this practice to others and will most definitely be back myself. I have struggled with skin issues for over 20 years and have been to so many dermatologists. It is wonderful to find a place where you feel comfortable and are treated with kindness and professionalism. Not to mention the improvement in appearance and self confidence, which is priceless. Again, I'm so thankful to have found this office and Dr. Minars. Living in Miami, I absolutely love the sun, but I have to face it; the sun doesn't always love me. After searching long and hard for a trust worthy dermatologist, I finally found Dr. Blyumin. She is kind, takes her time to thoroughly check your skin and listen to your concerns. She communicates clearly and makes sure that you understand what your options are; discussing with you which plan of action makes the most sense for you personally. I left feeling like I had received the high quality treatment I always hope to get, but never really do, from my doctor's appointments. My skin is now looking better than ever! This was 100% worth the drive from Miami.